Three field trials on Darlington unit #1, #3 and #4 were performed in January-1999, May- 1999 and April-2000, for in-situ ultrasonic examination of L-0 and L-1 blade roots and rotor steeples. The ultrasonic system uses automated and manual phased array technology, capable of high-speed rate and reliable detection and sizing. The system capability was demonstrated on 1:1 scale mock-ups and reference blocks, using EDM notches. Targets as small as 2 x 0.5 mm on steeple hooks and 3 x1 mm on blade roots could be detected and reliable sized. A custom built UT simulation software: Imagine 3D interfaces with SimScan to produce 1:1 2-D views and generates the spreadsheets with target and probe coordinates and ultrasonic path and angles (refracted and skew) to hit that target. The Ray-tracing simulated results were validated by experimental measurements. 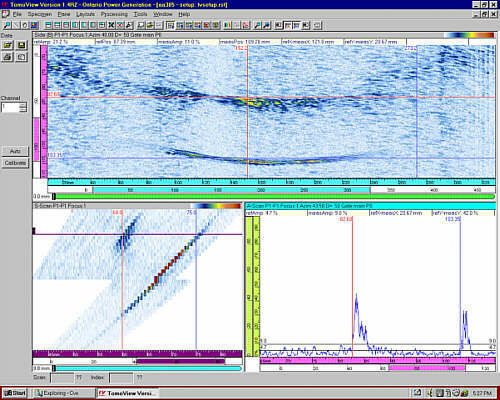 Examination of L-0 blade and rotor steeple grooves was performed with 2 phased array Focus systems under networking. Data analysis was done in real time. 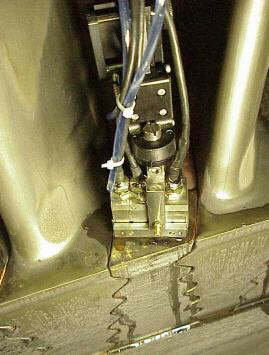 Single-head automatic and manual phased array was performed on L-1 blade roots and steeple (hook 1). Four-head identical automatic manipulator was tested on L-1 steepels. 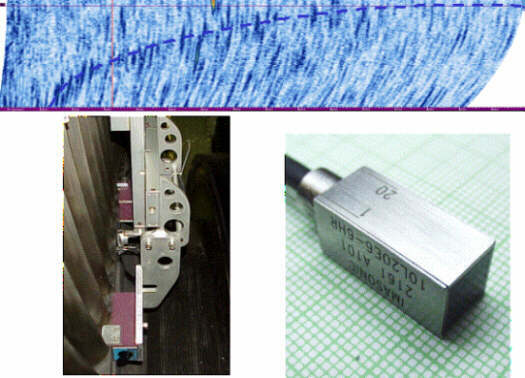 Special linear array probes were designed by OPGI and manufactured by Imasonic. They performed very well during a long examination period. Accuracy in sizing depends on ultrasonic technique (specular or diffracted), on part geometry and defect location (UT path). High-frequency phased array probes accurate detected and sized artificial and natural defects within the following tolerances: for specular ± 0.3 mm for height, ± 1 mm for length; for side techniques: ± 0.8 mm for height and ± 1.5 mm for length. Location of indication in 2-D specimen layout is within ± 2 mm space envelope for blade root, and within ± 4 mm for rotor steeple. New developments under way will lead to a better sizing and plotting, to an increase speed and to a reduced file size. Representative results from the 3 field trials / examinations will be presented. The system(s) will be full-speed commissioned for the next outage: April 2001. Ontario Power Generation operates four CANDU reactors of 900 MW at Darlington. The turbine group was manufactured by ABB-Baden. Each unit has three low-pressure turbines. ABB recommended in 1995 to de-blade the rows L-0 and L-1 (last two stages) and check the rotor steeple grooves and blade roots for possible fatigue / corrosion cracks. This recommendation would lead to an increase of outage time by 8-10 days and a high-probability of damaging the L-0 blades and steeples. Another short fall would be the lack of a reliable monitoring NDT technique and life assessment tool. 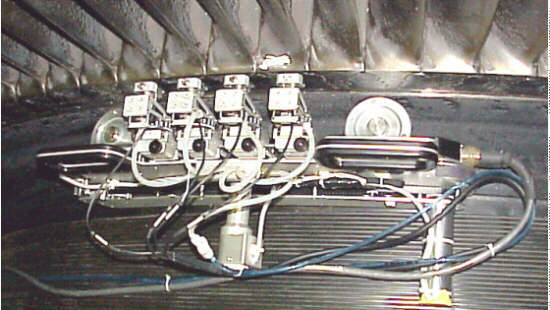 Darlington turbine engineering asked Specialized Inspection and Maintenance Department (SIMD) to start a feasibility study, and to commission an advanced automatic system to inspect these ABB parts (see Figure 1). Due to complexity of blades and steeple, limited access and high-performance requirements, RD Tech - CANADA in co-operation with SIMD develop a phased array system capable to drive high-frequency phased array probes, with advanced data analysis and plotting in 2-D (3-D) specimen. Early results and progressive reports were published during 1997-1999[ 1-4 ]. The present paper will summarized the project history and will present representative results from capability demonstration on mock-ups in the lab conditions and the last field trial. 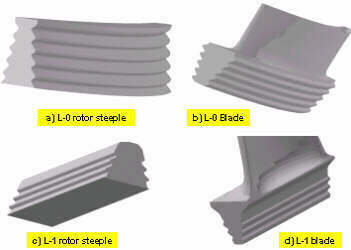 Fig 1: ABB blade roots and rotor steeple grooves to be inspected with phased array UT. The field trial history and hardware / software development are presented in Table 1 and Table 2. (*) Side = Concave (CCV) / Convex (CVX) ; Face = inlet (I) / outlet (O) ; Location : Platform (P), hook 1 (H1), hook 2 (H2), hook 3 (H3), hook 4 (H4), hook 5 (H5). The main ultrasonic techniques are illustrated in Figure 2-4. Fig 2: Principle of ultrasonic inspection for L-1 steeple (ends) and L-0 steeple. Fig 3: Principle of phased array inspection with a fixed probe on hook 1 - L-1 steeple. Fig 4: Inspection from side of L-1 blade and through the wing of L-0 blade. 1999 / May	 L-0 Blade	 5 x 1 - P, H1	 1.5	 0.7	 3.5	 Manual P.A. ;Min.detection 5 x 0.5 mm; limited aut. L-1 Blade	 3 x 1 - H1	 1.2	 0.7	 2	 Manual P.A. L-1 Blade	 3 x 1 - H1	 1.2	 0.7	 2	 Scan 4-blades same time ;manual scan in parallel. The ultrasonic phased array probes were designed by OPG and manufactured by Imasonic - France. Details about phased array probes used for turbine inspection are presented in another Conference paper [ 5 ]. 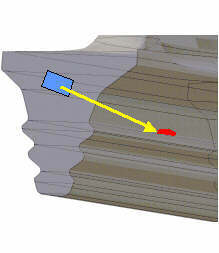 Fig 5:Detection of stacked EDM notches 9 x 1 mm on Hook 1- 5 on L-0 steeple. Fig 6: Detection of 4 EDM notches on L-1 blade using DDF board. Manual phased array. Fig 7: Detection and sizing of various EDM notches on platform Convex - L-0 blade. Fig 8: Calibration on 3 EDM notches - manual P.A. on L-1 steeple. Fig 9: Sizing of elliptical EDM notches 9 x 1 mm on hook 2 - Convex - L-0 steeple. Fig 10: Simulation of defect - probe correlation for L-0 blade. Defect located on platform. Validation of focal laws and inverse - forward problem solving for all 4 items was performed with simulation package Imagine 3D and SimScan. Details about this application are presented in another Conference paper [ 6 ]. An example of simulation used for L-0 blade is presented in Figure 10. Three field trials were performed in Jan. 1999, May 1999 and April 2000. Custom built manipulators from RD Tech and OPG-SIMD were used in different scanning techniques with specific phased array probes. Some results are presented in Figure 11 - 15. The field trials concluded the phased array technology matured and full inspection capability will be available for next outage - April 2001. Fig 11: Inspection diagram of parallel inspection with data analysis outside turbine area. Fig 12: 4-blade manipulator used for L-1 blade / steeple inspection Fig 13: Detection of small flaw ( 5 x 1 mm ) on concave side - platform - L-0 blade Fig 14: Inspection of L-1 steeple with X-Y manipulator and probe #2C. Fig 15: 3-head L-0 steeple manipulator on inlet side. Productivity, data analysis time and reliability of ultrasonic systems were also demonstrated. Detection and sizing of real defect are within design requirements. Ultrasonic data were analyzed in closer to real time (1-5 minutes difference). Turbine engineering was informed by the end of each shift about significant indications. Accuracy in detection, sizing, location and orientation were within fitness-for-purpose criteria. The authors wish to thank to OPG-NOSS-SIMD Management Team for granting the publication of this paper. A. Lamarre, N. Dubé, P. Ciorau, and B. Bevins: "Feasibility study of ultrasonic Inspection using phased array of turbine blade root" - 5-th EPRI Workshop Steam Turbine/Generators - July 1997. P.Ciorau, D. MacGillivray, A. Lamarre, and F. Jacques: "Feasibility study of ultrasonic inspection using phased array of turbine blade root and rotor steeple grooves-part 2" - EPRI Phased Array Seminar-Portland, Sept. 1998. P. Ciorau, et. al: "In-situ examination of ABB L-0 blade roots and rotor steeple of low- pressure steam turbine, using phased array technology. Proof of principle results", 6-th EPRI Workshop Steam Turbine / Generators -August 1999. D. Mair, P. Ciorau, D. Owen, and T. Hazelton: "Ultrasonic Simulation - Imagine 3D and SIMSCAN. Tools to solve the inverse problem for complex turbine components-part 1"- The 26-th QENDE Annual Review of Progress July 25-30, Montreal, 1999. G. Fleury, J. Poguet, P. Ciorau: " Special linear phased array probes used for ultrasonic examination of complex turbine components" - 15-th WCNDT-Rome, 2000. 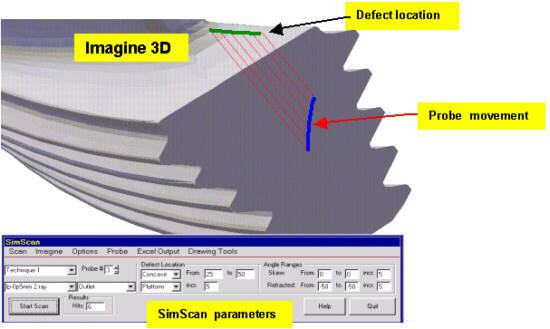 D.H. Mair, P. Ciorau, D. Owen, G. Dunning, T. Hazelton:" Ultrasonic Simulation - Imagine 3D and SimScan:Tools to solve the forward / inverse problem for complex turbine components-part 2".- 15-th WCNDT, Rome, 2000.